Two second half goals for Armagh Harps by Ryan McShane and Ultan Lennon, turned a dull and sloppy first half into a highly entertaining game. Harps claiming their first Senior Football Championship title since 1991. Having also defeated Maghery in that final. Maghery, to their credit defended their title gallantly but Harps ran out 4 point winners on a scoreline of 2-9 to 0-11. It took 8 minutes for the opening score, from the boot of Stefan Forker. A possession which started with a strong challenge by Brendan Haveron in defence. Within the first 12 minutes of the match, both teams had chances. Maghery scoring 3/4 shots, while Harps missed their single opportunity. 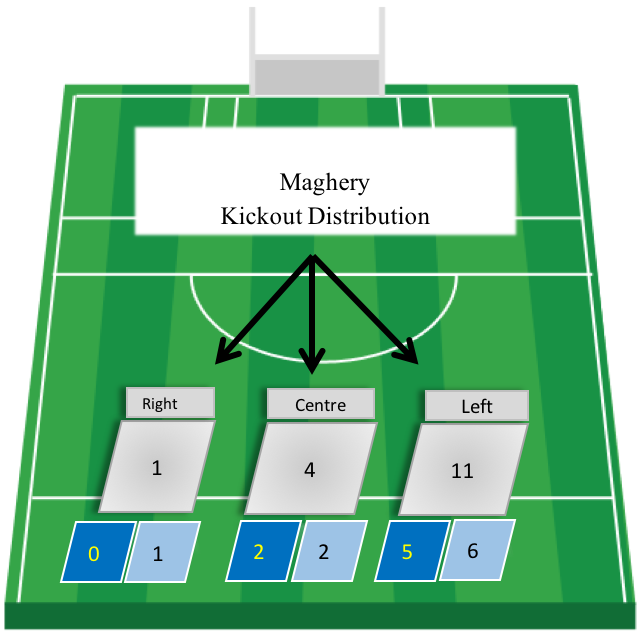 Maghery did register a second through Brian Fox, once James Lavery won his sides kickout to begin an attack. A quick turnaround saw Armagh Harps open their account, McShane spliting the posts after his side won their own kickout. A great block by Ciaran Higgins from Charlie Vernon’s shot allowed Maghery to counter-attack. Finishing with captain James Lavery swinging over a left footed effort. A wonderful cross field pass by Aidan Forker opened up the Harps defence. Finding his brother Stefan who knocked over Maghery’s 4th of the evening. After Brian Fox had turned over a Harps attack, meaning 75% of Maghery’s scores had come from turnovers. Maghery’s defence were well on top at this stage as they had turned the Harps over 13 times. 10 of which within their own defensive third. 5 Harps attacks were intercepted within a matter of minutes with Lavery (2), Stephen Cusack, Conor Mackle and ‘keeper Johnny Montgomery all working hard to minimise the Harps attacking threat. The Harps eventually got their second score of the game through an Ultan Lennon point before a long range shot from Maghery’s Ronan Lappin pushed his team into a 0-5 to 0-2 lead. Leaving the current champions 3 points to the good at the half time break. 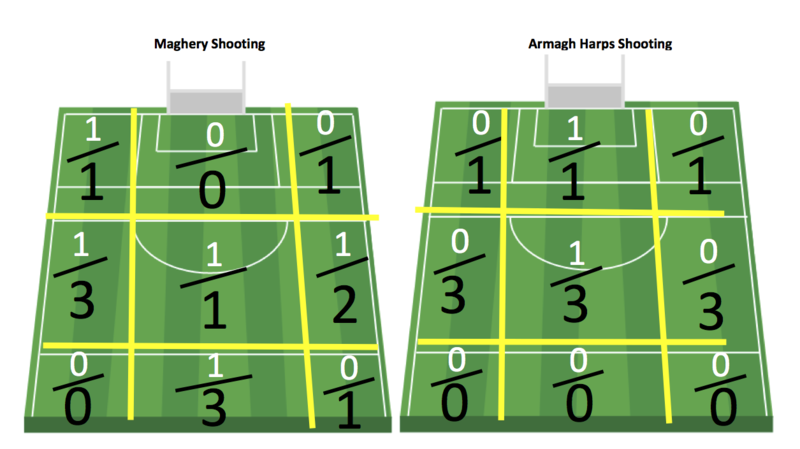 Maghery’s main source of scores came from turning the Harps over and effectively counter attacking. 3 times in the first 30 minutes. They had a higher turnover rate than Armagh Harps – 18 turnovers (14 in defence) in the opening period. 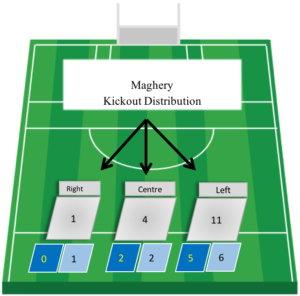 More productive up front Maghery converted 42% of their 12 shots, from 20 attacks. 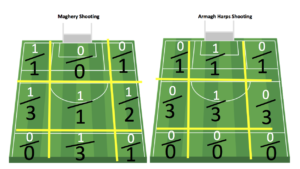 The Harps had only 11 turnovers, however they did turn over 9 of Maghery’s attacks in their own defence, while only turning one of these turnovers into scores. Their other source of scoring came from winning their own kickouts, which they had done very efficiently throughout the half. The Harps tactic of kicking their restarts short told the tale of their first half. Retaining 100% of their 10 kickouts, while also winning 4/7 of Maghery’s all via break balls. Getting bodies around Maghery’s midfield, and breaking the ball away from Lavery and Ben Crealey. However they failed to turn this possession into scores converting only 2/12 shots (17%) from 21 attacks. Maghery stretched their lead to 4 points 18 seconds into the second half. James Lavery won the throw up to set up a Conor Mackle point. The game was then turned on its head, as Maghery, who seemed in control of the game, conceded 2 goals in 20 seconds. Karol Loughran won his sides kickout, setting up an attack where Ryan McShane’s ‘one-two’ pass with Rory McGrath left the wing forward in on goal where he rattled the back of the net with a powerful shot past Montgomery. Loughran won the resulting kickout again, and his delivery to Ultan Lennon allowed Lennon to score the Harps second goal and put his side in the driving seat. The score now 2-2 to 0-6. Maghery responded in heroic fashion, rattling over three pointed frees from the trusty left foot of Aidan Forker in as many minutes to put his side back on top by the minimum of margins. With 20 minutes now left to play, the game was in the balance, with Harps leaders standing tall all over the field. Lennon levelled 2 minutes later with a free. Originating from a turnover by Mark McConville in the Harps defence. Harps improved their conversion rate significantly in the opening 10 minutes of the second period. Scoring 75% of their 4 chances, two of which were the crucial goals by McShane and Lennon. Lennon was once again on target nudging his side ahead before captain Conor White drove forward to score. After McShane won the ball from a Maghery kickout. 3 of the Harps 7 scores had now came from turnovers. The town side went ahead by 2 points with 15 minutes left on the clock. A wonderful long range point by Lennon from near the sideline put the Harps 3 up, with Charlie Vernon helping out, with two terrific catches in the centre of the park. Lennon was now in top form, scoring a long range free from 50 metres out. Leaving his side now in control, while Maghery went on search of a goal chance. They would have to settle for a point, as Seamus Forker, assisted by Aidan Forker reduced the gap to 3 points, entering the final 10 minutes. The Harps determination shone through as Lennon again pointed from the dead ball to restore a 4 point lead. Maghery drove forward in numbers but failed to get the needed scores. David Lavery and Stefan Forker both kicking wides at crucial stages of the final 5 minutes. Maghery’s big goal chance arrived when Ben Crealey flicked a high ball goal bound. But it was brilliantly saved from the quick reflexes of Paddy Morrison. Morrison’s save displaying the Harps resolve and with time almost up the fans began to believe it was their day. Maghery did register 1 final point through Aidan Forker’s 4th of the second half. Conor Murphy’s fisted point provided the Harps with an insurance point, leaving the score 2-9 to 0-11. Referee Kevin Faloon ended to game at the kickout to scenes of joy and from the Harps players and fans. They will now face Fermanagh Champions Derrygonnelly in the quarter final of the Ulster Championship. Maghery’s continuation of turnovers provided 50% of their scores in the second half. They managed to turn the Harps over 11 times in the second 30 minutes of play. Maghery had 17 shots in the second half, 29 throughout the game, converting 38% of them. 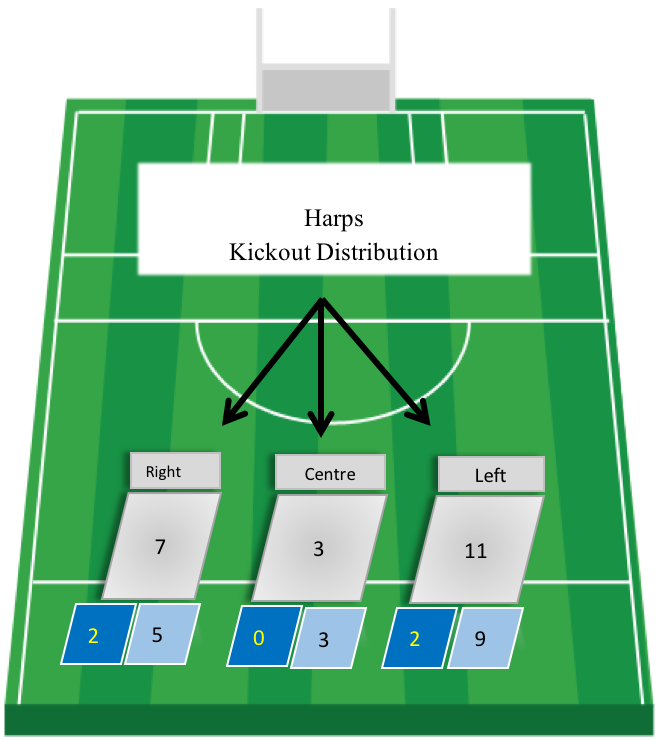 Harps failed to have the same dominance from their own kickouts in the second half. Retaining 7 from 11 and providing 3 of their second half scores. Their shooting improved in the second half to take their shot accuracy to 42% across the 60 minutes. Maghery: Johnny Montgomery, Kevin Nugent, Oisin Lappin, Ciaran Higgins, Brendan Haveron, Stephen Cusack, David Lavery, James Lavery(0-1), Ben Crealey, Shea Tennyson, Conor Mackle (0-1), Ronan Lappin (0-1), Brian Fox (0-1), Stefan Forker (0-3), Aidan Forker (0-4). Subs: Paul Forker for S. Tennyson, Gerard Campbell for C. Higgins, Seamus Forker for B. Fox, Niall Forker for C. Mackle. Harps: Patrick Morrison, Sean Farry, Karol Loughran, Conn Stevenson, Rory McGrath, Declan McKenna, Mark McConville, Josh Loughran, Conor White (0-1), Ryan McShane (1-1), Joe McElroy (0-1), Lorcan Oliver, Charlie Vernon, Ultan Lennon (1-5), Simon McCoy. Subs: Tom O’Kane for R. McGrath, Conor Coulter for S. McCoy, Conor Murphy (0-1) for C. White, Paul Kelly for L. Oliver.